은 조선 중기 문신인 이상길(1556∼1637)을 그린 초상화이다. 선생은 선조 18년(1585) 문과에 급제한 뒤 평안감사, 공조판서 등을 역임하였다. 이 초상화는 가로 93㎝, 세로 185㎝의 크기이고 의자에 앉은 모습을 그렸다. 머리에는 낮은 사모를 쓰고 붉은색의 관복을 입었으며, 두 손은 소매 안으로 마주 잡아 보이지 않는다. 옷의 옆트임 안쪽으로 보이는 속옷과 양쪽 어깨의 기울기를 달리해 안정되어 보이는데, 이러한 자세는 조선 중기 초상화에 나타나는 특징이다. 그러나 얼굴에 있어 윤곽선의 농도를 다르게 하여 표현하는 방법은 조선 후기에 나타나는 수법으로 후대에 다시 그려진 것으로 보인다. 비록 모본으로 추정되기는 하지만 원본을 따라 충실하게 그렸고, 필체가 섬세하고 보관상태도 양호하여 귀중한 자료로 평가된다. This is the portrait of Yi Sanggil (1556~1637), a civil minister of mid Joseon who held various posts as a government official. 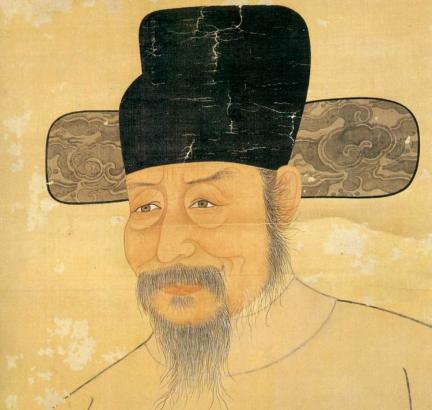 He passed the civil service examination in 1585 and then returned to his hometown. He served both as a governor and as a minister. After his death, he was enshrined in Chungnyeolsa Temple in Ganghwado and was given the posthumous name of Chungsuk. This is a full-length portrait, 93cm wide by 185cm long and he is seated on a chair. He is wearing a low hat and an official red uniform with his hands hidden under the sleeves. The inner wear that was revealed from inside and the different tilt of the shoulders are typical characteristics of mid Joseon, while the different color depth of the face is characteristic of late Joseon. Though it is presumed to be a copy of the original, it is still regarded as an important artwork because it closely follows the touch of the original, and it is preserved well.